PLYMOUTH Albion claimed a vital win over Ampthill in difficult conditions at Brickfields on Saturday. 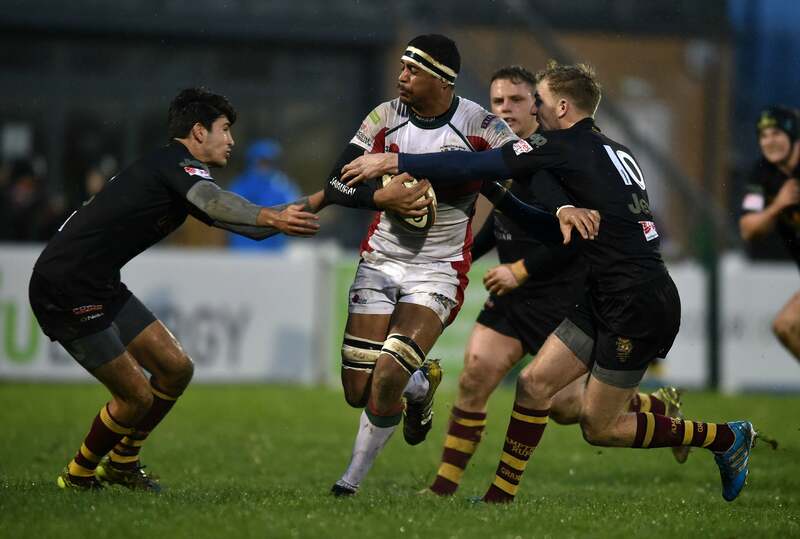 The young Albion team appeared to have learned a lot from their defeat against Darlington Mowden Park in the wind and rain two weeks earlier. The home side kicked well and kept Ampthill pinned back in their half for large spells of the game. Graham Dawe’s team also scrummed well. Their only problem was their line-out, where Ampthill, led by former Plymouth favourite Ben Gulliver, stole a lot of their ball, particularly first half. But all Albion wanted to do was get the win after back-to-back defeats against Blackheath and Darlington and they did that thanks to a Jake Murphy try and a penalty try, plus eight points from the boot of teenage fly-half Billy Searle. Injury-hit Ampthill, who had not lost to anyone outside the top five, did claim a late try to secure a bonus point but Albion always looked in control of a match that was spoiled by heavy rain second half. Albion made three changes to their team that had lost 34-3 at Blackheath the week before. Dan Collier returned after missing the trip to London due to illness. He replaced teenager Jim Massey, while Matt Shepherd and Sam Matavesi, who had come off the bench at Blackheath, were handed starting roles in place of Cameron Setter and Cameron Thompson. Ampthill included former Albion players Gulliver and Elliot Clements-Hill in their starting line-up. Albion had a great chance in the opening two minutes. They got within five-metres of Ampthill’s line but lost the ball with a poor pass. Searle then missed the chance to give his side the lead with a penalty from the left after a good scrum by the home side. Albion were really struggling with their line-out but they were impressing in the scrum. And they got another penalty from the set-piece in the 30th minute which Searle kicked this time to give his side the advantage. Those three points seemed to give the home side confidence. They kicked well and Ampthill’s back three struggled to gather on a number of occasions but Albion were not able to take advantage, mainly because their line-out was not functioning. But on the stroke of half-time they did get the try their territory deserved when captain Jake Murphy went over on the left following a scrum. Searle was unable to convert, but Albion did go in 8-0 up. The start of the second half was held up for nearly seven minutes due to an injury to Ampthill prop Lewis Brunger. After the restart, Nile Dacres showed his power to come close to scoring. The referee ruled he had been held up and from the scrum Albion got a penalty. They opted for another scrum and were awarded a penalty try, which Searle kicked to make it 15-0. Conditions worsened after that with rain pelting down and the wind picking up. The visitors had prop Henry Peck sin-binned in the 60th minute but while he was off the field, Ampthill scored six points with Clements-Hill kicked two penalties. Searle, however, kicked one of his own to make it 18-6 after a good break by Marc Koteczky. Albion’s fly-half, though, surprisingly missed another almost in front of the posts seven minutes later. Albion had to defend hard at the end as their Bedfordshire visitors looked for a bonus point. It looked like Albion had prevented them from scoring a try but in the last minute the visitors snatched a bonus point when Harry Agnew went over after it had looked like Ampthill knocked on. Clements-Hill converted to make it 18-13. Albion: Ethan Ford, Tom Bedford, Jake Murphy (capt), Marc Koteczky, Harrison Cully, Billy Searle, Matt Shepherd, Ollie Dawe, James Penman, Christian Judge, Dan Collier, Ed Holmes, Nile Dacres, Sam Matavesi, Herbie Stupple. Reps: Rupert Freestone, Gregory Sebastien, Cameron Thompson, Cameron Setter, Robin Wedlake. Amptill: Elliot Clements-Hill, Jonny Morgan, Elliott Reeder, Maxwell Wilkins, Gavin Williams, Cameron Keenan, Lewis Brunger, James Fish, Aleki Lutui (capt), Ben Gulliver, Josh Tyler, Tom Nutley, Matthew Burke, Darrell Dyer. Reps: Henry Peck, Matthew Collins, Harry Agnew, Kieran Duffin, Stuart Livesey.